Following Kennedy’s assassination in 1963, Lyndon B. Johnson acceded to office and served as President from 1963 to 1969. Following Kennedy’s plan, Johnson passed the Civil Rights Bill immediately following JFK’s assassination. Due to his popularity, Johnson was reelected in 1964 in a landslide victory. The Great Society was a collection of programs related to civil rights, economic opportunity, education, healthcare, environmental protection, and public broadcasting. During his presidency, Johnson also escalated American involvement in the Vietnam War, leading to increased protests at home and fewer funds to support his Great Society. Great Society: A set of domestic programs in the United States spearheaded by President Lyndon B. Johnson, aimed at the elimination of poverty and racial injustice. War on Poverty: The unofficial name for legislation first introduced by United States President Lyndon B. Johnson during his State of the Union address, on January 8, 1964, aimed at economically uplifting the United States. Lyndon Baines Johnson (August 27, 1908-January 22, 1973), also known as LBJ, was the 36th President of the United States, serving from 1963-1969. Johnson had served as Vice President in the Kennedy administration and assumed the presidency upon Kennedy’s death on November 22nd, 1963. Johnson was reelected in a landslide in 1964; however, he did not seek reelection in 1968 on account of his declining popularity. Johnson was renowned for his domineering personality and, relatedly, his great skill in persuading congressmen and other politicians to support him. He accomplished an ambitious domestic agenda, enacting the “Great Society” and “War on Poverty,” which were a collection of programs related to civil rights, economic opportunity, education, healthcare, environmental protection, and public broadcasting. Historians argue that the Great Society and War on Poverty mark the peak of liberal policy in the United States, and the culmination of the New Deal era. Johnson is rated highly by many historians because of his success in enacting domestic policies. Lyndon B. Johnson, in the Oval Office. : Former U.S. President Lyndon B. Johnson. Johnson was sworn in as President on Air Force One at Love Field Airport in Dallas, Texas, on November 22, 1963, two hours after President Kennedy was assassinated in Dealey Plaza. He was sworn in by Federal Judge Sarah T. Hughes, a family friend, making him the first president sworn in by a woman. He is also the only president to have been sworn in on Texas soil. Johnson did not swear on a Bible, as there were none on Air Force One; a Roman Catholic missal was found in Kennedy’s desk and was used instead for the swearing-in ceremony. 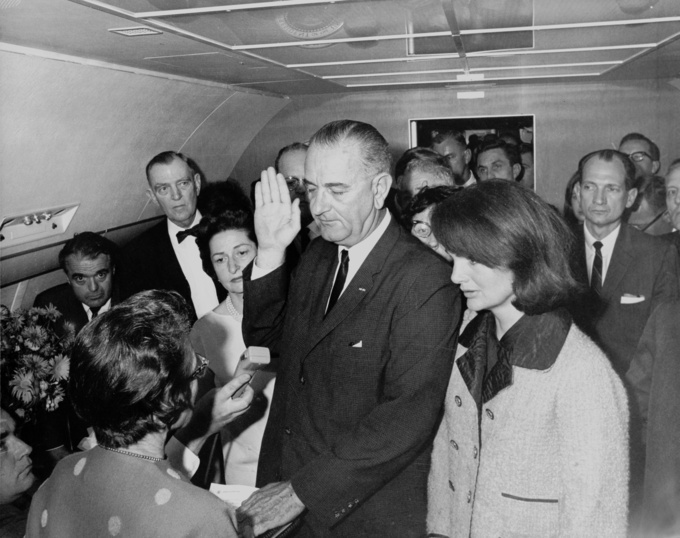 Lydnon B. Johnson, taking the oath of office aboard Air Force One: Johnson became the 36th President of the United States on November 22nd, 1963, following the assassination President Kennedy. Johnson would go on to win the election in 1964, accomplishing much of his ambitious domestic agenda. In the days following the assassination, Johnson made an address to Congress: “No memorial oration or eulogy could more eloquently honor President Kennedy’s memory than the earliest possible passage of the Civil Rights Bill for which he fought so long.” The wave of national grief following the assassination gave enormous momentum to Johnson’s promise to carry out Kennedy’s programs. Johnson created a panel headed by Chief Justice Earl Warren, known as the Warren Commission, to investigate Kennedy’s assassination. Johnson’s cabinet included several members of Kennedy’s cabinet. Johnson retained Dean Rusk as Secretary of State, Robert McNamara as Secretary of Defense, as well as Kennedy’s Secretaries of Agriculture and the Interior, all for the duration of his presidency. Former presidential candidate Adlai Stevenson continued as Johnson’s Ambassador to the United Nations until Stevenson’s death in 1965. Attorney General Robert F. Kennedy (President Kennedy’s brother), with whom Johnson had a notoriously difficult relationship, remained in office for a few months, leaving in 1964 to run for the Senate. Johnson brought to his presidency a vision of a Great Society in which everyone could share in the opportunities for a better life that the United States offered, and in which the words “liberty and justice for all” would have real meaning. One of the chief pieces of legislation that Congress passed in 1965 was the Elementary and Secondary Education Act, increasing federal funding to both elementary and secondary schools. The Higher Education Act, signed into law the same year, provided scholarships and low-interest loans for the poor, increased federal funding for colleges and universities, and created a corps of teachers to serve schools in impoverished areas. Johnson’s administration passed other acts to improve transportation, protect the environment, and improve safety standards in food and motor vehicles, to name a few. His war on poverty dominated his presidency and included such acts as the 1964 Economic Opportunities Act, the 1965 Housing and Development Act, and the 1965 Social Security Act. His Great Society also included passing Kennedy’s Civil Rights Act of 1964, the most far-reaching civil rights act yet passed by Congress. The act banned discrimination in public accommodations, sought to aid schools in efforts to desegregate, and prohibited federal funding of programs that permitted racial segregation. Further, it barred discrimination in employment on the basis of race, color, national origin, religion, or gender, and established an Equal Employment Opportunity Commission. These were followed by the Voting Rights Act of 1965 and the Civil Rights Act of 1968. Johnson escalated American involvement in the Vietnam War, reversing Kennedy’s policy of disengagement. Under Johnson, American troop presence went from 16,000 American advisors and soldiers in 1963, to 550,000 combat troops in early 1968. American casualties soared during this time. The war stimulated a large, angry antiwar movement based especially on university campuses in the U.S. and abroad. As the Vietnam War escalated, the money spent to fund it also increased, leaving less to pay for the many social programs Johnson had created to lift Americans out of poverty. Johnson knew he could not achieve his Great Society while spending money to wage the war. He was unwilling to withdraw from Vietnam, however, for fear that the world would perceive this action as evidence of American failure, and doubt the ability of the United States to maintain its position as a superpower. Increasing race riots, rising crime rates, and the ending of the Great Society through the latter years of Johnson’s presidency sapped support for Johnson’s liberal civil rights and anti-poverty policies, and strengthened right-wing calls for “law and order.” The Democratic Party split into four factions, and after an embarrassingly poor performance in the 1968 New Hampshire primary, Johnson ended his bid for reelection. Republican Richard Nixon was elected to succeed him. Republicans would dominate the presidency, winning five out of the next six presidential elections, until the election of Bill Clinton in 1992. The Great Society was a series of domestic programs promoted by President Lyndon B. Johnson and Democrats in Congress, between 1963-1969. The Great Society programs addressed education, racial injustice, poverty, the environment, and health care, among other issues. This era has been described as the peak of liberalism in the United States. The Economic Opportunity Act of 1964 established the Office of Economic Opportunity, which oversaw a majority of the social programs designed to combat poverty. Major programs that emerged during the War on Poverty included the Job Corps, the Neighborhood Youth Corps, VISTA, Upward Bound, the Food Stamp Act of 1964, the Community Action Program, and Head Start. The educational initiatives included in the Great Society legislation increased the role of the federal government in primary, secondary, and higher education. In 1965, Johnson created National Endowments for the Arts and Humanities to provide funding opportunities for the development of arts and culture. Public television and radio also emerged in this era. The Department of Transportation was established to oversee the development of urban public transportation networks, and consumer and environmental protection were also prioritized by Johnson’s administration. Poverty rates declined significantly during the Great Society initiatives; however, critics often oppose the increase in welfare programs, which they link to socialism. National Endowment for the Arts: An independent agency of the United States federal government that offers support and funding for projects exhibiting artistic excellence; created by an act of the U.S. Congress in 1965 as an independent agency of the federal government. New Frontier: A phrase used by liberal Democratic presidential candidate John F. Kennedy at the 1960 United States Democratic National Convention as the Democratic slogan to inspire America to support him; the phrase developed into a label for his administration’s domestic and foreign programs. The Great Society was a set of domestic programs promoted by President Lyndon B. Johnson and Democrats in Congress, during his presidency from 1963-1969. Some of the programs were designed to eliminate poverty and racial injustice; others provided for federal involvement in education, medical care, environmental protection, and arts and culture. Some historians consider the Great Society to be the peak of liberalism in the United States, and the high-watermark of governmental expansion in the nation’s history, often compared to Franklin Delano Roosevelt’s New Deal of the 1930s and 40s. The Democratic majority in Congress allowed Johnson to make sweeping legislative changes. Fourteen task forces composed of academics and experts were appointed by President Johnson to craft New Frontier legislation and develop foreign policy, each studying one aspect of United States society. Domestic issues were the predominant focus, with only one task force dedicated to foreign policy. Other policy areas addressed included agriculture, civil rights, education, efficiency and economy, health, income maintenance policy, preservation of natural beauty, transportation, and urban problems. The most ambitious and controversial part of the Great Society was its initiative to end poverty. The Kennedy Administration had been contemplating a federal effort against poverty, and Johnson, who had observed extreme poverty as a school-teacher in Texas, adopted Kennedy’s program. In the first months of his presidency, Johnson declared an “unconditional war on poverty,” with the lofty goal of eliminating hunger and deprivation from American life. The War on Poverty’s programs reflected a consensus among the Johnson administration that poverty was best addressed through the creation of economic opportunity, rather than by simply raising incomes, as Johnson emphasized in speeches around the country. The approach thus focused on education, job training, and community development. In addition, funding was provided for the establishment of community health centers to expand access to health care, while major amendments were made to Social Security in 1965 and 1967 that significantly increased benefits, expanded coverage, and established new programs to combat poverty and raise living standards. In addition, average Aid to Families with Dependent Children (AFDC) payments were 35% higher in 1968 than in 1960; however, they still remained insufficient and unevenly dispersed. The centerpiece of the War on Poverty was the Economic Opportunity Act (EOA) of 1964, which created an Office of Economic Opportunity (OEO) to oversee a variety of community-based anti-poverty programs. The OEO was responsible for administering most of the War on Poverty programs, including VISTA, Job Corps, Head Start, Legal Services, and the Community Action Program. The Great Society included federal educational programs, including several programs directed at primary and secondary education. The Elementary and Secondary Education Act of 1965, designed by Commissioner of Education Francis Keppel, allotted more than $1 billion to help schools purchase materials and start special education programs at schools with high concentrations of low-income children. The Higher Education Facilities Act of 1963 authorized more federal aid for universities in five years than the Land Grant College had in the previous century. This act was followed by the Higher Education Act of 1965, which increased federal money to universities, created scholarships and low-interest loans for students, and established a national Teacher Corps to provide teachers to poverty-stricken areas of the United States. The OEO launched Project Head Start as an eight-week summer program in 1965. The project was designed to help end poverty by creating a program for preschool children from low-income families that addresses emotional, social, health, nutritional, and psychological needs. President Johnson also launched Project Follow Through, implemented in 1967, to follow up with graduates of the Head Start program. The policy trains disadvantaged and at-risk youth, and has provided more than two million disadvantaged young people with integrated academic, vocational, and social skills training. Job Corps continues to help 70,000 youths annually at 122 Job Corps centers throughout the country. Besides vocational training, many Job Corps also offer GED programs, as well as high school diplomas and programs to get students into college. The Great Society left an enduring legacy in its healthcare programs. The Social Security Act of 1965 authorized Medicare, which provided federal funding for the medical treatment of elderly and disabled Americans. The program made benefits available to all Americans over age 65, regardless of need, and linked payments to the existing private insurance system. The Social Security Act also created Medicaid, a program funding health care for low-income Americans. In 1966, all welfare recipients began receiving medical care through Medicaid. The Great Society also created programs to benefit the arts. In 1964, the National Commission on the Humanities released a report arguing that the nation’s emphasis on science endangered the study of the humanities. In September of 1965, Johnson signed the National Foundation on the Arts and Humanities Act, creating both the National Endowment for the Arts (NEA) and National Endowment for the Humanities (NEH). Richard Nixon dramatically expanded funding for NEH and NEA. The Great Society also first established public television. The Public Broadcasting Act of 1967 chartered the Corporation for Public Broadcasting as a private, non-profit corporation and provided federal aid. The CPB initially collaborated with the pre-existing National Educational Television system, but in 1969 it started the Public Broadcasting Service (PBS). The CPB soon undertook a study of public radio, which led to the establishment of National Public Radio (NPR), a public radio system under the terms of the amended Public Broadcasting Act. The air we breathe, our water, our soil and wildlife, are being blighted by poisons and chemicals which are the by-products of technology and industry. The society that receives the rewards of technology, must, as a cooperating whole, take responsibility for [their] control. To deal with these new problems will require a new conservation. We must not only protect the countryside and save it from destruction, we must restore what has been destroyed and salvage the beauty and charm of our cities. Our conservation must be not just the classic conservation of protection and development, but a creative conservation of restoration and innovation. The Great Society also included policies related to labor. Amendments made to the 1931 Davis-Bacon Act in 1964 extended the prevailing wage provisions to cover fringe benefits, and several increases were made to the federal minimum wage. The EOA fought rural poverty by providing low-interest loans to those wishing to improve their farms or start businesses. EOA funds were also used to provide housing and education for migrant farm workers. Other legislation created jobs in Appalachia, one of the poorest regions in the United States, and brought programs to American Indian reservations. One of EOA’s successes was the Rough Rock Demonstration School on the Navajo Reservation, which, while respecting Navajo traditions and culture, also trained people for careers and jobs outside the reservation. Since the launch of the Great Society and the War on Poverty, there has been a contentious debate over its impact. Historians and economists try to assess the effects on poverty rates and the economy, with many competing analyses put forward. Some argue Johnson’s policies succeeded and significantly reduced poverty rates. Others argue the policies had negative effects on the economy and led to more poverty in the long-term. The poverty rate is defined as the percentage of Americans living below the “absolute poverty line,” which is defined by the Office of Health and Human Services as the threshold at which families can afford the basic necessities of food, shelter, and clothing. For example, the 2011 poverty line was a yearly income of $22,350 for a family of four. The War on Poverty coincided with a reduction in poverty rates. The United States government began keeping comprehensive records of the poverty rate in 1958, and the poverty rate had been declining when the War on Poverty was launched in 1964; it fell from 22.4% in 1959 to 19% in 1964. The poverty rate declined further after the implementation of the War on Poverty, hitting a low point of 11.1% in 1973. That year, President Nixon dismantled the Office of Economic Opportunity (the agency in charge of the War on Poverty’s key programs), transferring many of its programs to other agencies. The poverty rate has fluctuated between 11% and 15.2% since then. Poverty among Americans between ages 18-64 has fallen only marginally since 1966, from 10.5% then to 10.1% today. Poverty has significantly fallen among Americans under 18 years old, from 23% in 1964, down to less than 17%, although it rose to 20% in 2009. The most dramatic decrease in poverty was among Americans over 65, which fell from 28.5% in 1966 to 10.1% today. In 2004, more than 35.9 million, or 12% of Americans, including 12.1 million children, were considered to be living in poverty, with an average growth of almost one million per year. Even noting the decline in poverty rates, there is still disagreement about the effects of the War on Poverty and the Great Society. From President Johnson’s first speeches about the Great Society, critics charged the policies were an attempt to institute socialism. Some economists, including Nobel Laureate Milton Friedman, have argued that Johnson’s policies actually had a negative impact on the economy because of their interventionist nature. Adherents of this school of thought recommend that the best way to fight poverty is not through government spending but through economic growth. They would explain the reduction in the poverty rate as caused by the economic growth of the 1950’s and 60’s, or as a short-term effect of policies, later counter-balanced by negative long-term effects of the policies. The War on Poverty’s attention to African Americans led to a backlash among many white Americans. The policies created the perception of favoritism among many economically advantaged whites, along with resentment for having to “foot the bill” for services to the poor. This perception led to diminished support for many welfare programs, especially those targeted to specific groups and neighborhoods (primarily African Americans, immigrants, and other people of color). Responses to these criticisms pointed out that anti-poverty programs are necessary not for the well-being of the poor, but for the highest American principle of justice. In this argument, economic inequality leads to inequality of opportunity so severe that Americans cannot ignore it and still claim to be a free and equal society. President Johnson’s Great Society made improvements to elementary, secondary, and higher education through a series of acts. Distinguish the key features, as well as the effects, of the Elementary and Secondary Education Act, the Higher Education Facilities Act, and the Higher Education Act. In 1965, the Elementary and Secondary Education Act provided federal funding for public education.The Higher Education Facilities Act of 1963 increased federal funding to colleges by more than five times their current amount. The Higher Education Act of 1965 increased college funding further, including the creation of federally-backed scholarships and loans. Higher Education Act of 1965: Legislation signed into U.S. law as part of President Lyndon Johnson’s Great Society domestic agenda, with the aim of strengthening the educational resources of colleges and universities, and providing financial assistance for students in postsecondary and higher education. Higher Education Facilities Act of 1963: Legislation signed into U.S. law by President Johnson that authorized a dramatic increase in college aid and provided better college libraries, 10-20 new graduate centers, several new technical institutes, classrooms for several hundred thousand students, and 25-30 new community colleges each year. Elementary and Secondary Education Act: A United States federal statute enacted on April 11, 1965 as a part of President Lyndon B. Johnson’s “War on Poverty,” allotting more than $1 billion to help schools purchase materials, start special education programs in schools with a high concentration of low-income children, and establish the Head Start program. The most important educational component of Johnson’s Great Society was the Elementary and Secondary Education Act of 1965, designed by Commissioner of Education Francis Keppel. It was signed into law on April 11, 1965, less than three months after it was introduced. It ended a long-standing political taboo by providing significant federal aid to public education, initially allotting more than $1 billion to help schools purchase materials, and to start special education programs in schools with a high concentration of low-income children. The Act also established Head Start, which had originally been started by the Office of Economic Opportunity as an eight-week summer program, as a permanent program. 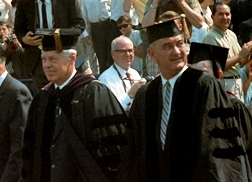 The Higher Education Facilities Act of 1963, which was signed into law by Johnson a month after he became president, authorized a dramatic increase in college aid within a five-year period and provided better college libraries, 10-20 new graduate centers, several new technical institutes, classrooms for several hundred thousand students, and 25-30 new community colleges each year. This major piece of legislation was followed by the Higher Education Act of 1965, signed into United States law on November 8, 1965 at Texas State University. The Act increased federal money given to universities, created scholarships and low-interest loans for students, and established a national Teacher Corps to provide teachers to poverty-stricken areas of the United States. The Act also began a transition from federally-funded institutional assistance to individual student aid. The Higher Education Act of 1965 was reauthorized in 1968, 1971, 1972, 1976, 1980, 1986, 1992, 1998, and 2008. Congress is currently in the process of reauthorizing the Act, which was set to expire at the end of 2013 but was extended through 2015. Before each reauthorization, Congress amends additional programs, changes the language and policies of existing programs, or makes other changes. Signing Plaque: This signing plaque rests on campus grounds of Texas State University commemorating the Higher Education Act. Lyndon B. Johnson, committed to preventing the expansion of communism, increased U.S. involvement in the war in Vietnam. President Kennedy, Johnson’s predecessor, had planned the withdrawal of troops from Vietnam in 1963. Lyndon B. Johnson, however, was committed to the domino theory—the belief that communism in one nation would quickly spread to surrounding countries. In August of 1964, clashes occurred between North Vietnamese vessels and the U.S. navy in the Gulf of Tonkin; the lack of clarity around the details of the events has created a great deal of controversy. Following the incident, Johnson was empowered by Congress with the Gulf of Tonkin Resolution, which allowed him to conduct military operations without a declaration of war or congressional approval. Under President Johnson, the number of American troops in Vietnam rose from 16,000 in 1964 to more than 553,000 by 1969.
domino theory: The theory that, if South Vietnam fell to Communism, it would be followed by Cambodia, Laos, and additional South Asian countries. North Vietnam: A communist state in southeast Asia that ruled from 1954 until 1976. Gulf of Tonkin: A body of water located off Northern Vietnam and Southern China; a northern arm of the South China Sea. When Lyndon B. Johnson assumed the U.S. Presidency after the death of John F. Kennedy, he did not consider the turbulent situation in South Vietnam a priority. Progressive social reforms of the Great Society and War on Poverty were of greater concern to Johnson. He did believe, however, in the domino theory—if one country came under Communist rule, neighboring countries would soon follow. Soon after taking office, Johnson issued National Security Action Memorandum No. 273, establishing his administration’s commitment to containing North Vietnam ‘s aggression through military means, thus reversing Kennedy’s policy to withdraw U.S. military presence from Vietnam. In effect, Johnson escalated the war, following the controversial Gulf of Tonkin incident. At the time Johnson took office in 1963, there were 16,000 American military advisors in South Vietnam, in the midst of the deteriorating political and military situation that existed in the region. The South Vietnamese war effort was hindered by widespread corruption in the government of Ngo Dinh Diem, the first president of South Vietnam (in power since 1955). The South Vietnamese Army, the Army of the Republic of Vietnam (ARVN), was unable to stop the advances of the Northern Viet Cong army. In 1961, the newly elected Kennedy administration promised more aid to the war effort (including money, weapons, supplies), but these were of little effect. Doubt arose among Washington D.D. policy-makers that Diem was capable of defeating the opposing Chinese Communist regime in the North; some feared Diem might negotiate with Ho Chi Minh, the president of North Vietnam. Discussions about South Vietnamese regime change began in Washington and were concluded on November 2, 1963, when the CIA aided a group of ARVN officers in the overthrow of Diem. To help contain the post-coup chaos, Kennedy increased the number of U.S. advisors in South Vietnam to 16,000. The South Vietnamese government was run by a twelve-member military revolutionary council, headed by General Duong Van Minh. There was chronic instability in the ARVN, as several coups—not all successful—occurred within a short period of time. Johnson was assuming the presidency at a tenuous time of military setbacks and political instability in South Vietnam. The Gulf of Tonkin Incident proved an escalating factor of the war and justification of continued American presence in Vietnam. During this incident, the destroyer U.S.S. Maddox engaged three North Vietnamese Navy torpedo boats in a sea battle, resulting in several North Vietnamese casualties. On August 2, 1964, the U.S.S. Maddox, conducting an intelligence mission along the coast of North Vietnam, allegedly fired upon and damaged several torpedo boats; the boats had been stalking the Maddox in the Gulf of Tonkin. Two days later, in the same area, the Maddox along with the U.S.S. Turner Joy each reported they had been attacked by North Vietnamese ships. The second attack prompted retaliatory air strikes. In response, Congress passed the Gulf of Tonkin Resolution, which gave the president broad powers to conduct military operations in Southeast Asia without declaring war, and thus without seeking congressional approval. This served as Johnson’s legal justification for deploying U.S. forces, and the commencement of open warfare against North Vietnam. Although at the time Congress denied that the Resolution was a full-scale declaration of war, the Tonkin Resolution allowed the president full discretion to commit military forces; thus, Johnson had initiated America’s direct involvement in the ground war in Vietnam. While the Johnson administration claimed Vietnamese boats had fired first, subsequent investigations suggest that the battle was initiated by the Maddox. Some historians believe that Johnson knowingly used the Gulf of Tonkin incident to gain the support of the American people to enter into the Vietnam War. Under President Johnson, the number of American troops in Vietnam rose from 16,000 in 1964, to more than 553,000 by 1969. The U.S. also financed and supplied the forces of all the American allies in the Vietnam War, including Australia, New Zealand, Thailand, the Philippines, and the Republic of Korea (second only to the Americans in troop strength). The period after 1964 is thus referred to as the Americanization of the war, with the United States taking on the primary responsibilities of fighting the North Vietnamese. President Johnson had already appointed General William C. Westmoreland to succeed General Harkins as Commander of MACV in June 1964. Westmoreland expanded American troop strength in South Vietnam. On February 14, 1965, the National Leadership Committee installed Air Vice-Marshal Nguyen Cao Ky as prime minister. In 1966, the junta selected General Nguyễn Văn Thiệu to run for president with Ky on the ballot as the vice-presidential candidate in the 1967 election. Thieu and Ky were elected and remained in office for the duration of the war. In the presidential election of 1971, Thieu ran for the presidency unopposed. With the installation of the Thieu and Ky government (the Second Republic), the U.S. had a pliable, stable, and semi-legitimate government in Saigon with which to establish a relationship. In February of 1965, a U.S. air base at Pleiku in the Central Highlands of South Vietnam was attacked twice by the NLF, resulting in the deaths of over a dozen U.S. personnel. These guerrilla attacks prompted the administration to order retaliatory air strikes against North Vietnam. Operation Rolling Thunder was the code name given to a sustained strategic bombing campaign, inaugurated on March 2, 1965, targeted against the North by aircraft of the U.S. Air Force and Navy. Its original purpose was to bolster the morale in South Vietnam and to serve as a signaling device to Hanoi. U.S. airpower would act as a method of “strategic persuasion,” deterring the North Vietnamese politically by the fear of continued or increased bombardment. Rolling Thunder gradually escalated in intensity, with aircraft striking only carefully selected targets. When that did not work, its goals were altered to target the nation’s industrial base, transportation network, and its (continually increasing) air defenses. After more than a million sorties were flown and three-quarters of a million tons of bombs were dropped, Rolling Thunder ended on November 11, 1968. For U.S. troops participating in this and other operations (Operation Masher/White Wing, Operation Attleboro, Operation Cedar Falls, Operation Junction City, and dozens of others) the war boiled down to hard marching through some of the most difficult (and unfamiliar) terrain on the planet, and weather conditions that were alternately hot and dry or cold and wet. The Americans learned that PAVN (which was basically a light infantry force) was not a rag-tag band of guerrillas, but was instead a highly disciplined, proficient, and well-motivated force. Guerrilla warfare tactics made it difficult for the U.S. military to distinguish friend from foe. Desertion rates increased, and morale plummeted. North Vietnam, utilizing the Ho Chi Minh and Sihanouk Trails, matched the U.S. at every point of the escalation, funneling manpower and supplies to the southern battlefields. In 1967 and 1968, U.S. soldiers were being killed at the rate of over 1,000 per month. Meanwhile, the Viet Cong’s ranks grew from approximately 5,000 in 1959 to 100,000 in 1964. 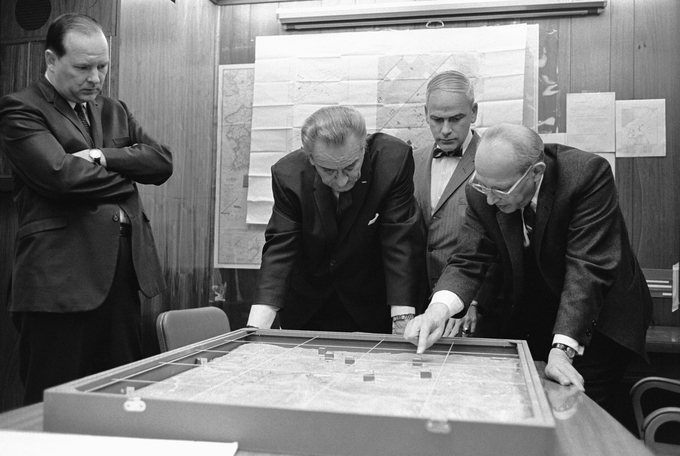 Walt Rostow shows President Lyndon B. Johnson a model of the Khe Sanh area: President Johnson believed in the “domino theory” and escalated America’s involvement in Vietnam. Incumbent President Lyndon Johnson won the 1964 presidential election with 61% of the popular vote. At the start of the election, the Republican Party was deeply divided between its conservative and moderate-liberal factions. Republican candidate Barry Goldwater ‘s conservative platform alienated moderate Republicans; however, Goldwater succeeded in the Deep South due to his opposition to the Civil Rights Act of 1964. Johnson’s campaign successfully portrayed Goldwater as a dangerous extremist, and African American voters became increasingly alienated from the Republican Party with this election. Despite his defeat, Goldwater is credited with laying the foundation for the conservative revolution of the coming decades. Lyndon B. Johnson: The 36th President of the U.S. (1963-1969). Barry Goldwater: A businessman and five-term United States Senator from Arizona (1953-1965, 1969-1987) and the Republican Party’s nominee for president in the 1964 election. By the time of the United States presidential election of 1964, incumbent President Lyndon B. Johnson had held the office for nearly one year following the assassination of his predecessor, John F. Kennedy. Johnson, whose campaign had successfully tied him to Kennedy’s popularity, won 61.1% of the popular vote—the largest win since 1820. In his campaign, Johnson spoke eloquently about two favorable social programs, known as the Great Society and the War on Poverty. Republican candidate Senator Barry Goldwater could not secure the complete support of own party due to his unpopular conservative political platform. Johnson’s campaign successfully portrayed Goldwater as a dangerous extremist; although he lost the election by a wide margin, Goldwater became influential to the modern conservative movement, and his so-called extremest views became central to the Republican Party. The 1964 election campaigns proceeded against the backdrop of the tragic death of President Kennedy, assassinated on November 22, 1963, in Dallas, Texas. The loss of the charismatic Kennedy was notably shocking and upsetting to his supporters, while opposition candidates faced the awkward position of running against the policies of a slain president. So as not to appear disrespectful, Republican leaders called for a political moratorium during the subsequent period of mourning. As such, little campaigning took place by either major party until January of 1964, when primary season officially began. It was the view of political pundits of the time that Kennedy’s assassination left the nation politically unsettled. Barry Goldwater, Senator from Arizona and Republican Candidate for President in 1964: Goldwater’s conservative views and penchant for unscripted remarks helped Johnson win in a landslide. However, Goldwater’s right-wing conservatism soon became the dominant ideas of the Republican Party. At the start of the election, the Republican Party was deeply divided between its conservative and moderate-liberal factions. Conservatives favored a small, low-tax federal government that supported individual rights and business interests, while opposing social welfare programs. Conservatives also resented the dominance of the GOP’s moderate wing (based at the time in the Northeastern U.S.). Since 1940, the eastern moderates had successfully defeated conservative presidential candidates at the GOP’s national conventions. Conservatives likened eastern moderates to liberal Democrats, both in their philosophy and their approach to government. Goldwater’s chief opponent for the Republican nomination was Nelson Rockefeller, Governor of New York and longtime leader of the GOP’s liberal-moderate faction. 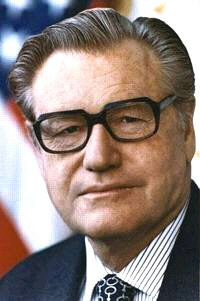 Nelson Rockefeller, Governor of New York. : Nelson Rockefeller was a the leader of the moderate wing of the Republican Party. He was the front-runner to receive the Republican nomination in the election of 1964, until his divorce and remarriage alienated social conservatives. Although Goldwater successfully rallied conservatives, he was unable to broaden his support base for the general election. Shortly before the Republican Convention, his vote against the Civil Rights Act of 1964 (which Johnson championed and signed into law) alienated most moderate Republicans. Despite the fact that Goldwater had actually voted in favor of the 1957 and 1960 Civil Rights Acts, the Johnson camp used Goldwater’s vote against the 1964 Act to portray him as a racist. Goldwater argued it was a matter for individual states rather than federal legislation. Ironically, Johnson (then the Senate Majority Leader) had strongly opposed both the 1957 and 1960 bills, and had helped to weaken them. Daisy TV Ad: Although it ran only once, the Daisy Ad evoked fears that Goldwater was an extremist, inclined to nuclear war. It was an early instance at psychologically powerful negative campaigning. In the end, Goldwater won only his native state of Arizona and five Deep South states that had been increasingly alienated by Democratic civil rights policies. Despite such a devastating loss, this was the best showing in the South for a GOP candidate since the post-civil war reconstruction era. Some political pundits and historians believe Goldwater laid the foundation for the conservative revolution to follow. The election also furthered the shift of the African American voting electorate away from the Republican Party, a phenomenon that had begun with Roosevelt’s New Deal of the 1930s. Since the 1964 election, Democratic presidential candidates have won almost consistently at least 80-90% of the African American vote. The Civil Rights Act of 1964 and the Voting Rights Act of 1965 were landmark pieces of legislation that addressed major forms of discrimination. The Civil Rights Act of 1964 was the most far-reaching civil rights act yet passed by Congress; it banned discrimination in public accommodations, aided schools in desegregation, and prohibited federal funding of programs that permitted racial segregation. Further, the act barred discrimination in employment on the basis of race, color, national origin, religion, or gender, and established an Equal Employment Opportunity Commission. Kennedy had fought hard during his presidency for this legislation; following his assassination, the bill was quickly passed by the newly inaugurated President Johnson, partially as a tribute to Kennedy’s legacy. This act was soon followed by the Voting Rights Act of 1965, which outlawed discriminatory voting practices. Despite the legislative achievements of both of these acts, they did not alleviate the widespread poverty, nor the persistence of violence against African Americans. 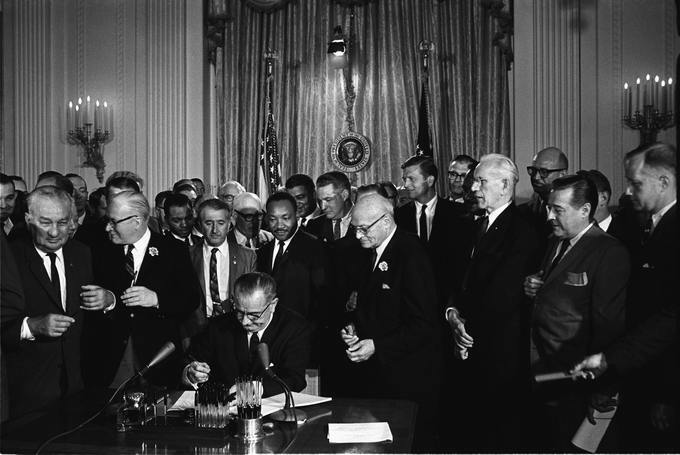 Voting Rights Act: A landmark piece of national legislation in the United States that outlawed discriminatory voting practices responsible for the widespread disenfranchisement of African-Americans in the U.S.
Great Society: A set of domestic programs in the United States announced by President Lyndon B. Johnson aimed at the elimination of poverty and racial injustice. Hubert Humphrey: The 38th Vice President of the United States, serving under President Lyndon B. Johnson. The Civil Rights Act of 1964, enacted on July 2, 1964, was a landmark piece of legislation. The most far-reaching civil rights act yet passed by Congress, it banned discrimination in public accommodations, sought to aid schools in efforts to desegregate, and prohibited federal funding of programs that permitted racial segregation. Further, it barred discrimination in employment on the basis of race, color, national origin, religion, or gender, and established an Equal Employment Opportunity Commission. The government’s powers to enforce the act were initially weak, but were augmented by later legislation. Congress asserted its authority to legislate about civil rights under three parts of the United States Constitution: its power to regulate interstate commerce under Article One (section eight), its duty to guarantee all citizens equal protection of the laws (under the Fourteenth Amendment ), and its duty to protect voting rights (under the Fifteenth Amendment). The Act was initiated by President John F. Kennedy and signed into law by President Lyndon B. Johnson, marking perhaps the most important domestic achievement of his Great Society program. The bill would soon be followed by the equally momentous Voting Rights Act, which effectively ended the disenfranchisement of blacks in the South. President John F. Kennedy called for a Civil Rights Act in his speech about civil rights on June 11, 1963. Kennedy asked for legislation “giving all Americans the right to be served in facilities which are open to the public—hotels, restaurants, theaters, retail stores, and similar establishments,” as well as “greater protection for the right to vote.” Kennedy’s civil rights bill included provisions to ban discrimination in public accommodations and to enable the U.S. Attorney General to launch lawsuits against state governments that operated segregated school systems. However, it did not include a number of provisions deemed essential by civil rights leaders, including protection against police brutality, ending discrimination in private employment, or granting the Justice Department power to initiate desegregation or initiate job discrimination lawsuits. Johnson, who wanted the bill passed as soon as possible, ensured that the bill would be quickly considered by the Senate. The bill came before the full Senate for debate on March 30, 1964, and the “Southern Bloc” of 18 southern Democratic senators and one Republican senator, led by Richard Russell, launched a filibuster to prevent its passage. Russell stated, “We will resist to the bitter end any measure or any movement which would have a tendency to bring about social equality and intermingling and amalgamation of the races in our (Southern) states.” The bill finally passed with six wavering senators providing a four-vote victory margin; the final tally stood at 71 to 29. Never in history had the Senate been able to muster enough votes to cut off a filibuster on a civil rights bill. The bill divided and engendered a long-term change in the demographics of both the Democratic and Republican Parties. President Johnson realized that supporting this bill would risk losing the South’s overwhelming support of the Democratic Party. Although majorities in both parties voted for the bill, there were notable exceptions. 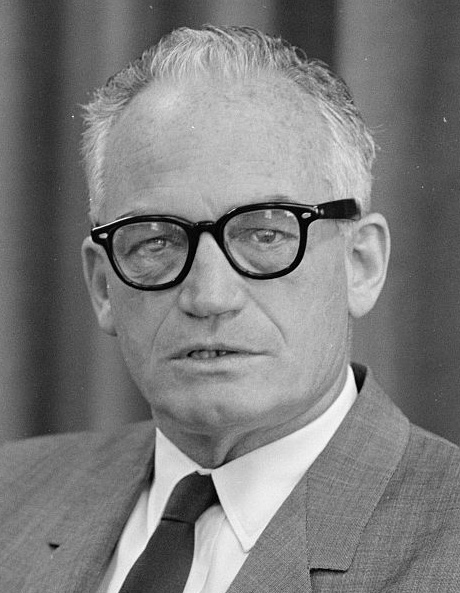 Republican Senator Barry Goldwater of Arizona voted against the bill, remarking, “You can’t legislate morality.” Goldwater had supported previous attempts to pass Civil Rights legislation in 1957 and 1960, as well as the 24th Amendment outlawing the poll tax; however, he rejected the idea of the national government regulating such acts. Protecting African Americans’ right to vote was as important as ending racial inequality in the United States. In January 1964, the Twenty-Fourth Amendment, prohibiting the imposition of poll taxes on voters, was finally ratified. Poverty would no longer serve as an obstacle to voting. Other impediments remained, however, especially in the form of violence and resistance from white voters. In an effort to address this violence, Johnson introduced a bill in Congress that would remove obstacles for African American voters and lend federal support to their cause. His proposal, the Voting Rights Act of 1965, prohibited states and local governments from passing laws that discriminated against voters on the basis of race. Literacy tests and other barriers to voting that had kept ethnic minorities from the polls were thus outlawed. Following the passage of the act, a quarter of a million African Americans registered to vote, and by 1967, the majority of African Americans had done so. The Civil Rights Act and the Voting Rights Act changed the lives of African Americans and transformed society in many ways. While Congress played an important role by passing the Acts, the actions of civil rights groups, such as the Student Nonviolent Coordinating Committee (SNCC), the Southern Christian Leadership Conference (SCLC), and the Congress on Racial Equality (CORE), were instrumental in forging new paths, pioneering new techniques and strategies, and achieving breakthrough successes. Civil rights activists engaged in sit-ins, freedom rides, and protest marches, and registered African American voters. Despite the movement’s many achievements and the advancements of legislation, however, many grew frustrated with the slow pace of change, the failure of the Great Society to alleviate poverty, and the persistence of violence against African Americans, particularly the tragic 1968 assassination of Martin Luther King, Jr. Attempts to register southern African American voters continued to encounter white resistance, and protests against this interference often met with violence. Images of white brutality appeared on television screens throughout the nation and in newspapers around the world. Lyndon Johnson Signing the Civil Rights Act, 1964: Lyndon Johnson singing the Civil Rights Act, surrouneded by congressmen and guests, including Dr. Martin Luther King Jr. The Immigration and Nationality Act of 1965 changed national immigration regulations to a model based on skills and family relationships. The Immigration and Nationality Act removed the immigration quotas established in the National Origins Formula (in place since the 1920s), which privileged immigrants from Northern and Western Europe. While the National Origins Formula had restricted immigration on the basis of country of origin (favoring immigration from Northern and Western Europe), the new Act focused on immigrants’ skills and family relationships with citizens or U.S. residents. This act was sponsored by New York Representative Emanuel Celler and Michigan Senator Philip Hart. This bill was unpopular with the American public but received bi-partisan support in Congress. Passage of this bill resulted in broad demographic changes in the United States as immigration from Latin America, Asia, and Mediterranean Europe increased. Immigration and Nationality Act of 1965: A piece of U.S. legislation that abolished the national origins quota system that had composed American immigration policy since the 1920s, replacing it with a preference system that focused on immigrants’ skills and family relationships with citizens or U.S. residents. National Origins Formula: An American system of immigration quotas, between 1921 and 1965, which restricted immigration on the basis of existing proportions of the population; its goal was to maintain the existing ethnic composition of the United States, giving low quotas to Eastern and Southern Europe. immigration: The act of passing or coming into a country for the purpose of permanent residence. xenophobia: The fear of that which is perceived to be foreign or strange. This can manifest itself in many ways involving the relations and perceptions of an in-group towards an out-group, including a fear of losing identity, suspicion of its activities, aggression, and desire to eliminate its presence to secure a presumed purity. The Immigration and Nationality Act of 1965 (also known as the Hart-Celler Act) changed the nation’s laws regulating immigration. The act had a profound and long-term affect on immigration into the United States and, thus, on American demographics. The act was co-sponsered by Representative Emanuel Celler of New York and Senator Philip Hart of Michigan, and it was strongly supported by United States Senator Ted Kennedy of Massachusetts. The Immigration and Nationality Act of 1965 abolished the National Origins Formula, which had been in place since the Immigration Act of 1924. The National Origins Formula had set immigration quotas for specific countries, effectively giving preference to Northern and Western Europe over Eastern Europe, Asia, South America, and Africa. This national origins quota system was viewed as an embarrassment by, among others, President John F. Kennedy, who called it “nearly intolerable”; many argued that such an unequal policy hampered American attempts to compete ideologically with the Soviet Union. The National Origins Formula was replaced with a preference system based on immigrants’ skills and family relationships with U.S. citizens or residents. Numerical restrictions on visas were set at 170,000 per year and per country-of-origin, not including immediate relatives of U.S. citizens or “special immigrants” (including those born in “independent” nations in the Western Hemisphere; former citizens; ministers; and employees of the U.S. government abroad). President Lyndon Johnson signed the bill at the foot of the Statue of Liberty as a symbolic gesture. The majority of the American people were opposed to the Immigration and Nationality Act, largely due to xenophobia and fears of how immigrants from these nations could influence the dominant white culture of the United States. To convince people of the legislation’s merits, the act’s proponents asserted that the act would not significantly influence American culture. President Johnson minimized the act’s significance, calling it “not revolutionary.” Secretary of State Dean Rusk estimated that only a few thousand Indian immigrants would enter the country over the next five years, and other politicians, including Edward Kennedy, hastened to reassure the public that the demographic mix would not be affected. In fact, these assertions would prove highly inaccurate. The Immigration and Nationality Act did change American demographics, leading to increases in immigration from Mediterranean Europe, Latin America, and Asia. By the 1990s, America’s population growth was more than one-third driven by legal immigration, as opposed to one-tenth before the act. Ethnic and racial minorities, as defined by the census bureau, rose from 25% in 1990 to 30% in 2000. Per the 2000 census, roughly 11.1% of Americans were foreign-born, a major increase from the low of 4.7% in 1970. One-third of those that were foreign-born were from Latin America, while one-fourth came from Asia. Immigration has always been a widely debated issue in the United States, since the country’s inception by European settler-invaders in the 18th century. The new waves of immigration enabled by the Immigration and Nationality Act of 1965 heightened this controversy among the American public. Despite economic fears held by many, immigrants have made significant contributions to the overall economy in the United States. However, debate continues to wage between ideas of assimilation (that immigrants should adopt white, English-speaking American culture), multiculturalism (the idea that groups should retain their distinctive identities and pursue political representation as groups), the economic impact of immigration, the impact of illegal immigration, and the role of languages other than English in public life. 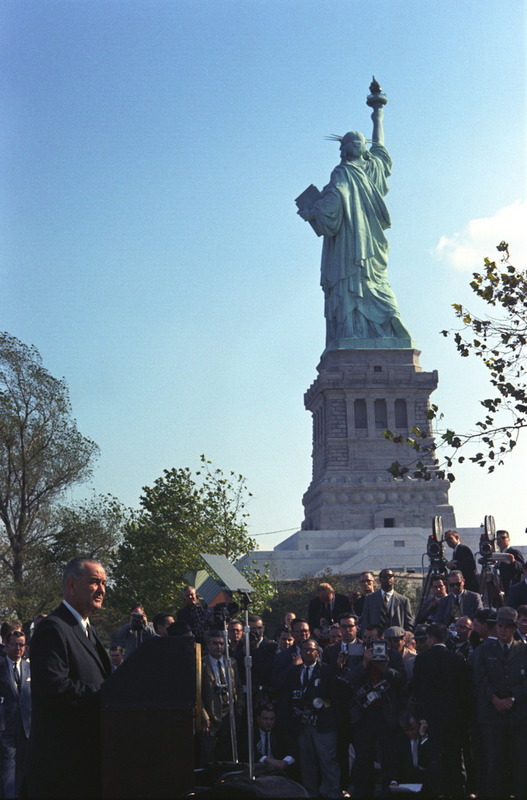 President Johnson signs the Immigration and Nationality Act at the foot of the Statue of Liberty: The Johnson administration supported the reform of the immigration laws, proposed by Democratic congressmen. The act would profoundly alter the nation’s demographics. To prevent the spread of communism, the Johnson Administration supported coup d’états in Brazil and the Dominican Republic. The Johnson administration supported the coup d’état that removed Brazilian President João Goulart from power in April of 1964 by providing supplies and naval support. In the Dominican Republic, a U.S.-backed military coup d’état deposed liberal President Juan Bosch in September 1963 and replaced him with a civilian junta led by Donald Cabral. When Cabral’s power was threatened by revolution, Johnson ordered U.S. military intervention, implemented with the aid and cooperation of the Organization of American States (OAS). In both cases, the Johnson administration wanted to prevent the rise to power of another Fidel Castro in the western hemisphere. Both events were strongly influenced by U.S. interest in maintaining its position as a world superpower and preventing the spread of communism; in order to do this, it provided armed support to institute governments that were more favorable to the United States. Fidel Castro: A Cuban politician and revolutionary who governed the Republic of Cuba as Prime Minister from 1959 to 1976 and then as President from 1976 to 2008.
junta: The ruling council of a military dictatorship. coup d’état: The illegal and overt seizure of a state by the military or other elites within the state apparatus. Juan Bosch: A politician, historian, short story writer, essayist, educator, and the first democratically elected president of the Dominican Republic for a brief time in 1963. Dominican Civil War of 1965: An armed conflict that took place between April 24, 1965 and September 3, 1965, in Santo Domingo; known to be the bloodiest armed conflict in the country in the 20th century. During the Johnson Administration, the United States intervened in domestic political conflicts in Latin and South American countries. American interventions in the Brazilian coup d’état of 1964 and the Dominican Civil War of 1965 are two notable examples. In both cases, the Johnson administration, wanting to prevent the rise to power of another Fidel Castro in the western hemisphere, chose to provide military support to one side of the conflict. These events were largely overshadowed by the Vietnam War and are not as frequently studied today. Both events were strongly influenced by U.S. interest in maintaining its position as a world superpower. In order to do this, U.S. leaders felt it necessary to prevent the spread of communism and support—or manipulate into existence—democratic and capitalist governments in nations around the world. By using U.S. armed forces in Brazil and in the Dominican Republic to overthrow communist and socialist leadership and institute governments that were more favorable to the United States, Johnson’s administration continued a long legacy of U.S. control in foreign affairs. The 1964 Brazilian coup d’état was a series of events that occurred in Brazil on March 31, 1964, that culminated with the overthrow of President João Goulart by the U.S. Armed Forces on April 1. The coup put an end to the government of Goulart, who was also known as Jango, a member of the Brazilian Labor Party. He was democratically elected Vice President by the people of Brazil in the same election that elected conservative Jânio Quadros. Goulart was from the National Labor Party and backed by the National Democratic Union to the presidency. 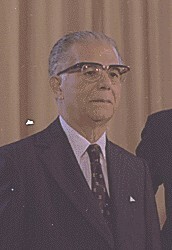 Quadros resigned in 1961, the same year of his inauguration, in a clumsy political maneuver to increase his popularity. According to the constitution then in force, Goulart should have automatically replaced Quadros as president, but he was away on a diplomatic trip. A moderate nationalist, Goulart was accused of being a communist by right-wing militants and was unable to take office. After a long negotiation led mainly by Goulart’s brother-in-law Leonel Brizola, Goulart’s supporters and the right-wing reached an agreement under which the parliamentary system would replace the presidential system in the country, and Goulart would be named head of state. In 1963, however, Goulart successfully re-established the presidential system through a referendum. He finally took office as president with full powers, and during his rule, several structural problems in Brazilian politics became evident, as well as disputes in the context of the Cold War, which helped destabilize his government. His Basic Reforms Plan, which aimed at socializing the profits of large companies toward ensuring a better quality of life for most Brazilians, was labeled as a socialist threat by both the U.S. military and right-wing sectors of Brazilian society, which organized major demonstrations against the government in the Marches of the Family with God for Freedom. The U.S.-backed coup successfully removed Goulart from office and subjected Brazil to a military regime, politically aligned to the interests of the U.S. government. The U.S. ambassador at the time and the military attaché kept in constant contact with President Lyndon Johnson as the crisis progressed. Johnson urged taking “every step that we can” to support the overthrow of João Goulart, helping the Brazilian military authorities against the left-winged Goulart government. The military regime that replaced Goulart would last until 1985, when Tancredo Neves would be indirectly elected the first civilian president of Brazil since the 1960 elections. The Dominican Civil War of 1965 was the second time the United States occupied the Dominican Republic. It began when the U.S. Marine Corps entered Santo Domingo on April 28, 1965 and ended in September of 1966. The coup d’état and civil war in the Dominican Republic was rooted in the election of Juan Bosch as president in 1962, following a period of political instability after the assassination of long-time dictator Rafael Trujillo in 1961. Opposition groups, known as Loyalists, launched a military coup d’état in 1963, effectively negating the 1962 elections by installing a civilian junta dominated by former members of the Trujillo regime and headed by Donald Reid Cabral, an American-educated businessman. Constitutionalists supported the return of Bosch, and widespread dissatisfaction produced a revolution on May 16. U.S. President Johnson, siding with the Loyalists and convinced that the defeat of the Loyalist forces would create “a second Cuba” on America’s doorstep, ordered a military intervention. All civilian advisers had recommended against immediate intervention, hoping that the Loyalist side could bring an end to the civil war on their own. President Johnson, however, ordered 42,000 soldiers and marines to the Dominican Republic. By April 29, 1966, a cease-fire was negotiated, and on May 5 the Act of Santo Domingo was signed by Colonel Benoit (a Loyalist), Colonel Caamaño (a Constitutionalist), and the Organization of American States (OAS) Special Committee. Backed by the United States, General Imbert, a Loyalist, became president of the Government of National Reconstruction. Further manipulation from U.S. military operations consolidated the Loyalist control of the government. The United States gradually began removing troops, turning policing and peacekeeping operations over to Brazilian troops. In democratic elections in 1966, Joaquín Balaguer was elected and enjoyed the overt support of the Johnson administration. While a group of new millionaires flourished during Balaguer’s administrations, supported by U.S investments, the overall poverty rate of the country increased dramatically. Joaquin Balaguer, 1977: After the Coup of 1965, Jaquin Balaguer became president of the Dominican Republic. Public support for the Vietnam War declined dramatically in the late 1960s in the United States, with protests and domestic activism growing steadily. In February of 1965, U.S. President Lyndon Johnson dramatically escalated the war in Vietnam with a sustained bombing campaign and the introduction of ground troops. Activists and intellectuals seeking a broad range of reforms in the 1960s came to be referred to as the New Left. Protests against the war in Vietnam through large-scale demonstrations and teach-ins grew steadily throughout the 60s, and most were led by student activists and groups, such as the Students for a Democratic Society (SDS). At the same time, mainstream public opinion turned increasingly against the war in the late 1960s. New Left: A range of activists, educators, agitators, and others in the 1960s and 1970s, who focused their attention on marginalized identities and, eventually, identity politics. Students for a Democratic Society: A university-based activist movement in the United States in the 1960s that was one of the main representations of the country’s New Left. Weather Underground: An American radical left organization that was first organized in 1969 as a faction of Students for a Democratic Society (SDS); their goal was to create a clandestine revolutionary party for the violent overthrow of the U.S. government. The Vietnam War met with rising opposition among Americans during the second half of the 1960s. A series of left-wing organizations, largely formed by students, staged increasingly vocal protests and demonstrations. At the same time, mainstream public opinion turned increasingly against the war in the late 1960s. In February of 1965, United States President Lyndon Johnson dramatically escalated the war in Vietnam with a sustained bombing campaign and the introduction of ground troops. Campus chapters of the Students for a Democratic Society (SDS) all over the country started to lead small, localized demonstrations against the war. In April of 1965, SDS organized a march on Washington for peace; about 20,000 people attended. That same week, the faculty at the University of Michigan suspended classes and conducted a 24-hour “teach-in” on the war. The idea quickly spread, and on May 15, the first national “teach-in” was held at 122 colleges and universities across the nation. Originally designed to be a debate on the pros and cons of the war, at Berkeley, the teach-ins became massive antiwar rallies. By the end of that year, there had been antiwar rallies in some sixty cities. During the winter and spring of 1967, protests on many campuses became increasingly militant. Leaders of anti-war movements were elected to student government at a few schools. Demonstrations against the Dow Chemical Company and other campus recruiters were widespread, and the issue of the draft grew more contentious. The FBI (mainly through its secret program COINTELPRO) and other law enforcement agencies were often exposed as having spies and informers in student-led anti-war chapters. The fall of 1967 saw further escalation of the anti-war actions of the New Left. The school year started with a large demonstration against Dow Chemical recruiters at the University of Wisconsin in Madison on October 17. Peaceful at first, the demonstration turned to a sit-in that was violently dispersed by the Madison police and riot squad, resulting in many injuries and arrests. A mass rally and student strike closed the university for several days. A coordinated series of demonstrations against the draft led by members of the Resistance, the War Resisters League, and SDS further galvanized anti-war sentiment. After the conventional civil rights tactic of peacefully picketing failed, Oakland, California’s “Stop the Draft” week ended in a number of skirmishes with the police. On October 21, 100,000 people marched on the Pentagon. Hundreds were arrested and injured. In addition to student-led protests, there was a shift in mainstream public opinion about the Vietnam War. Americans were increasingly skeptical about the way it was being handled, and many opposed the war itself. Opinion polls showed a steady decline in support for the war after 1965. As the war escalated, the money spent to fund it also increased, leaving less to pay for the many social programs Johnson had created to lift Americans out of poverty. Dreams of racial harmony suffered, as many African Americans, angered by the failure of Johnson’s programs to alleviate severe poverty in the inner cities, protested in frustration. Their anger was heightened by the fact that a disproportionate number of African Americans were fighting and dying in Vietnam. Nearly two-thirds of eligible African Americans were drafted, whereas draft deferments for college, exemptions for skilled workers in the military industrial complex, and officer training programs allowed white middle-class youth to either avoid the draft or volunteer for a military branch of their choice. As a result, less than one-third of white men were drafted. Many of the most outspoken political critics of the war were Democratic politicians, whose opposition began to erode unity within the party. In the election of 1968, Minnesota Senator Eugene McCarthy, who had called for an end to the war and the withdrawal of troops from Vietnam, received nearly as many votes in the New Hampshire presidential primary as Johnson did, even though he had been expected to fare very poorly. McCarthy’s success in New Hampshire encouraged Robert Kennedy to announce his candidacy for presidency as well. Johnson, suffering health problems and realizing his actions in Vietnam had hurt his public standing, announced that he would not seek reelection and withdrew from the 1968 presidential race. 1968 was characterized by political and social upheaval in the United States, and increased difficulties in Vietnam. 1968 was a year of serious upheaval in the United States, marked by the Tet Offensive in Vietnam, increasing anti-war protests, the assassinations of Dr. Martin Luther King, Jr., and Robert Kennedy, and a tumultuous election. The Tet Offensive was a surprise military action launched by North Vietnam in January 1968 against South Vietnam and allied U.S. forces. The Johnson administration’s poor handling of this event, and lack of honesty in addressing the American public, gave momentum to the anti-war movement at home. Both Martin Luther King Jr., and Democratic presidential candidate Robert Kennedy were assassinated in the spring of 1968, contributing to race riots and protests around the country. Also in the spring of 1968, student activists organized campus protests, rallies, sit-ins, and marches, culminating in the largest student strike in U.S. history on April 26. Kennedy’s assassination, and the violent suppression of anti-war protests outside of the Democratic National Convention, disrupted the Democratic Party; in an incredibly close race, Republican candidate Richard Nixon won the presidency. Robert F. Kennedy: An American politician, Democratic senator from New York, noted civil rights activist, adviser to President John F. Kennedy, and U.S. Attorney General from 1961 to 1964. Tet Offensive: A military campaign during the Vietnam War that was launched on January 30, 1968 by forces of the People’s Army of Vietnam against the forces of the Republic of Vietnam (South Vietnam), the United States, and their allies. Martin Luther King Jr: An American clergyman, activist, and prominent leader in the African-American Civil Rights Movement. 1968 was a year of serious upheaval in the United States. The nation experienced several traumatic events that made many wonder about America’s future. In January, the Tet Offensive undermined the American public’s confidence in the Vietnam War. In the spring, the assassinations of Martin Luther King, Jr., and Robert F. Kennedy, only one month apart, left many in the nation angry and demoralized. In addition, the presidential election of 1968 seemed to further divide the country. The Tet Offensive was a military campaign launched by the People’s Army of Vietnam on January 30, 1968. It was a surprise attack, coming after the Tet holidays, during which time a cease-fire had been customary. The offensive was a well-coordinated assault on positions around the country, with more than 80,000 communist troops striking more than 100 towns and cities, including 36 of 44 provincial capitals, five of the six autonomous cities, 72 of 245 district towns, and the southern capital of Saigon. The offensive was the largest military operation conducted by either side of the war up to that point. As a result of continued heavy fighting, 1968 became the deadliest year of the war for the U.S. forces, with 16,592 soldiers killed. During one week, the Military Assistance Command, Vietnam (MACV), posted very high U.S. casualty figures, with 543 killed and 2,547 wounded. On February 23, the U.S. Selective Service System announced a new draft call for 48,000 men, the second highest of the war. On February 28, Robert S. McNamara, the Secretary of Defense who had overseen the escalation of the war but had eventually turned against it, stepped down from office. Tension rose in the United States as anti-war sentiments continued increased among students, some politicians, and the general public. On April 4, 1968, Dr. Martin Luther King, Jr., was assassinated at the Lorraine Motel in Memphis, Tennessee. King, who had been an extremely effective leader in the Civil Rights Movement, was in Memphis to lead a protest against unequal wages and working conditions among Memphis’ sanitation workers. King was 39 years old. On June 10, 1968, James Earl Ray, a fugitive from the Missouri State Penitentiary, was arrested in London at Heathrow Airport, extradited to the United States, and charged with the murder of King. And then I got to Memphis. And some began to say the threats… or talk about the threats that were out. What would happen to me from some of our sick white brothers? Well, I don’t know what will happen now. We’ve got some difficult days ahead. But it doesn’t matter with me now. Because I’ve been to the mountaintop. And I don’t mind. Like anybody, I would like to live a long life. Longevity has its place. But I’m not concerned about that now. Millions across the nation were outraged by King’s death. King’s principles of non-violence, firm and organized resistance through direct action, Christian love, and racial equality, had succeeded in bringing civil rights to the attention of mainstream America. Despite the urging of political and community leaders, the assassination incited a wave of riots in more than 100 cities. Civil unrest affected at least 110 U.S. cities; Washington, Chicago, and Baltimore were among the most impacted. Just two months later, on June 5th, 1968, Robert F. Kennedy, Senator from New York and candidate for the Democratic nomination for president, was assassinated in Los Angeles. RFK, as he was often known, was the brother of the former President John F. Kennedy, and had become a leading candidate in the Democratic primaries. On the night of his assassination, he had won a major victory in the California primary and seemed to have clinched a two-man race with Hubert Humphrey. Kennedy addressed supporters shortly after midnight on June 5 at the Ambassador Hotel in Los Angeles. As he attempted to exit the hotel after his victory speech, Kennedy was shot; he died twenty-six hours later. His killer, Sirhan B. Sirhan, a Jordanian immigrant, had allegedly targeted him for advocating military support for Israel in its violent and oppressive conflict with neighboring Arab states. As a presidential candidate, Kennedy’s platform far outstripped that of his brother, John F. Kennedy, in its liberal vision of social improvement. Kennedy questioned the Democratic party’s policy under Johnson. He openly challenged young people who supported the war while benefiting from draft deferments, visited small towns, and made himself available to the masses by participating in long motorcades and street-corner stump speeches, often in under-resourced inner-cities. Kennedy made urban poverty a chief concern of his campaign, which led to enormous crowds at his campaign events in poor urban areas or poor rural areas of Appalachia. The election of 1968 capped a year of national turmoil. In the election of 1964, Democrat Lyndon B. Johnson had won the presidential election with the largest popular vote in American history. By 1968, his popularity had fallen so sharply, due to his support of the Vietnam War, that he chose not to seek reelection. With Johnson’s withdrawal, the Democratic Party quickly split into four factions, each of which distrusted the others: labor unions and big-city supporters of Vice President Hubert Humphrey; college students and upper-middle-class whites who actively opposed the war and rallied behind Senator Eugene McCarthy; Catholics, African-Americans, Hispanics, and other racial and ethnic minorities who were passionate supporters of Senator Robert F. Kennedy; and white Southern Democrats, or “Dixiecrats”, who rallied behind Alabama Governor George C. Wallace. Kennedy’s assassination altered the dynamics of the Democratic race. Although Humphrey appeared to be in the lead, he was an unpopular choice with many of the antiwar elements in the party. The 1968 Democratic National Convention in Chicago erupted in violence as police used clubs and tear gas against thousands of young activists who had gathered from around the nation to protest the Vietnam War. Broadcast on live television, the antiwar riots divided the Democratic Party’s base. In the end, the nomination itself was anticlimactic, with Vice President Humphrey handily beating McCarthy and McGovern on the first ballot. Piqued by the race riots following Dr. King’s assassination, the Republican campaign under Nixon promised to restore “law and order,” which appealed widely, especially to whites. On civil rights, Nixon framed his policies as racially egalitarian, stating his opposition to forced desegregation of schools but citing improved education as the key to equality. Nixon also proposed government tax incentives for African Americans to start small businesses and make home improvements in their existing neighborhoods. Democratic Humphrey, meanwhile, promised to continue and expand the Great Society welfare programs started by President Johnson, and to continue the Johnson Administration’s “War on Poverty.” He also promised to continue the efforts of Presidents Kennedy and Johnson, and the Supreme Court, in promoting the expansion of civil rights and civil liberties for minority groups. The November 5 election proved to be extremely close; it was not until the following morning that the television news networks called Nixon the winner. Nixon won the popular vote with a plurality of 512,000 votes, or a victory margin of about one percentage point. Nixon’s victory is often considered a realigning election in American politics. From 1932 to 1968, the Democratic Party was the majority party, and the election of 1968 dismantled the Democratic Party’s hegemony. From 1968 until 2008, the Republicans won seven of ten presidential elections, and its policies greatly constrained the Democratic administrations in the era, particularly the Clinton administration. 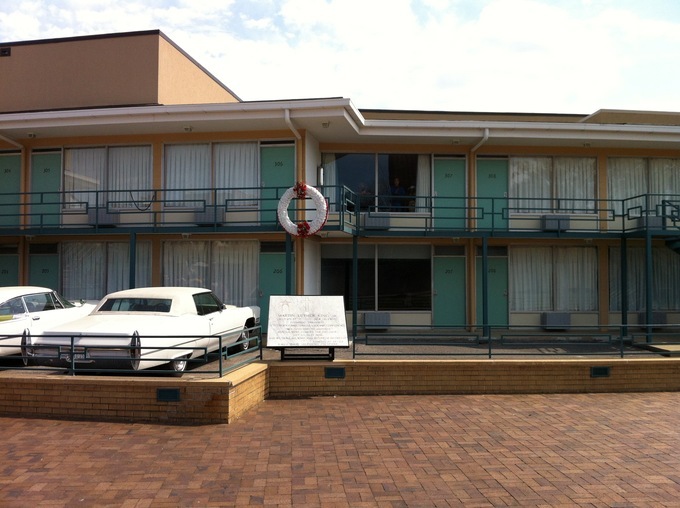 The Lorraine Motel, cite of MLK’s assassination: MLK’s assassination on April 4, 1968 prompted riots in cities around the country and was a blow to Americans who believed in civil rights.